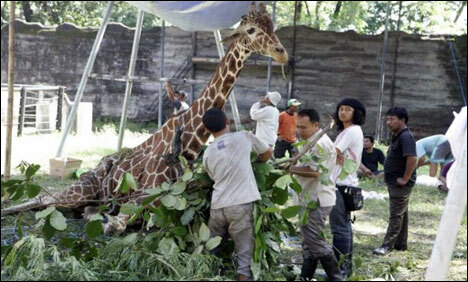 SURABAYA: A male giraffe that died in an Indonesian zoo was found to have 20 kilograms of plastic in its stomach, officials said Saturday, the latest suspicious animal death at the facility. Kliwon, 30, was born at Surabaya Zoo, the biggest in the country, and was its last remaining giraffe, living alone in its pen for 13 years. It died on Thursday. "We got the autopsy results last night. They found a plastic lump weighing around 20 kilograms and 60 centimetres in diameter in his stomach," zoo spokesman Anthan Warsito told. The giraffe was also found to be infected with tuberculosis. The plastic probably came from food wrappers the animal ingested after visitors tossed them into its pen over several years, Warsito said.